Bill Nye the Science Guy arrives to lead scientists and supporters down Constitution Avenue during the March for Science on April 22, 2017 in Washington, DC. WASHINGTON – Thousands of scientists and science enthusiasts of all ages flooded the streets of Washington despite a drizzling rain Saturday (April 22) in a March for Science to show their support for the scientific work that has made modern life possible. 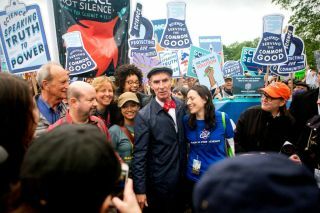 Throngs of demonstrators, many decked out in white lab coats, packed the National Mall ahead of the march for a rally kicked off by Bill Nye the Science Guy, a co-chair for the march and CEO of the Planetary Society that promotes space exploration. "Yet today we have a great many lawmakers —not just here, but around the world — deliberately ignoring and actively suppressing science," Nye added. Their inclination is misguided, and in no one's best interest." While Nye did not mention President Donald Trump, handmade signs and chants from the demonstrators (some called for the ouster of Scott Pruitt, the Trump-appointed head of the Environmental Protection Agency) showed their displeasure with the administration's policies on the environment and climate change. "Our lawmakers must know and accept that science serves every one of us. Every citizen of every nation in society. Science must shape policy. Science is universal. Science brings out the best in us." Nye said. "With an informed, optimistic view of the future, we can — dare I say it — save the world!" The White House released a statement for Earth Day, in which Trump said "My administration is committed to advancing scientific research that leads to a better understanding of our environment and of environmental risks," according to the New York Times, which added that the statement did not mention the march in Washington or its satellite marches. NASA astronaut Leland Melvin spoke to the crowd on the National Mall ahead of the march. Melvin, a veteran of two space shuttle missions who also served as NASA's associate administrator for education, retired from NASA in 2014. He talked about how he thought about the impact of science, particularly while looking down at Earth from space. "Let's work together as one team on this spaceship we call Earth," Melvin said. Nancy Grace Roman, the first female executive at NASA, also appeared with Nye at the March for Science. Roman had a prominent role in planning the Hubble Space Telescope, earning her the nickname "Mother Hubble," Live Science reports. Anousheh Ansari, the Iranian-American engineer and entrepreneur who became the first female space tourist when she bought a ticket to the International Space Station in 2004 addressed the Washington crowd with a theme of unity. "The language of science knows no race, no gender, no religion. It doesn't discriminate based on where you live or based on whether you're poor or wealthy," said Ansari according to Live Science, Space.com's sister publication. "The apple falls from the tree under the same laws, and in the same way no matter where you are in the world." Kat Fanning of Jersey City, New Jersey caught our eye early with her sign "Keep the Earth Clean, It's Not Uranus." The sign was made by a cousin, Fanning said. She was with a whole group attending the March for Science that also attended the Women's March in January. Fanning, a librarian at the Pratt Institute in New York and an American Museum of Natural History fellow, said she was there "because it's important to show up for things. If you don't show up, you don't get your voice heard." Paige Campbell and Madison Littin, both 20, are juniors at Pennsylvania State University and were part of a 150-person group that took three buses to Washington from State College, Pennsylvania to join the March for Science. It was Campbell, an astrophysics and meteorology student, who wrote the "Build Spaceships, Not Walls" sign. Littin is studying meteorology and emergency management. "I'm here because I'm a big advocate for science and climate change," Campbell told Space.com. "But I'm also a big advocate for space exploration because I am in astrophysics and I love space. And I think that some of the most important discoveries and inventions that we have have come from space exploration." "I think it's really important to get out here because right now policies are being created that are shutting down climate data, access to important research," Littin added. "And we need that research to make policies, good policies, and we need to protect the Earth that we have." Linda Montaquilo, 55, inked a double-sided sign that read "Make America Smart Again" on one side and "Make America Think Again" on the other. She and her husband Ron traveled from Jupiter, Florida to participate in the March for Science. "As a young child, I learned that we did not inherit this planet from our parents," Montaquilo said. "We are borrowing it from our children, and I am marching here today to make sure my children and my children's children have an Earth. To protect it." Susan Gunn of Lanham, Maryland brought her three daughters — Lillian, 16; Colleen, 14; and Mary, 11 — to the March for Science as part of a larger group carrying giant puppets of prominent scientists, including prominent women like astronauts Sally Ride and Mae Jemison, as well as Ada Lovelace and Marie Curie. (Gunn's puppet was Rosalind Franklin.) "I'm here because life is precious and there is no Planet B," Gunn told Space.com, adding that continuing climate change research is one of her biggest concerns. Gunn's oldest daughter Lillian carried the puppet of Sally Ride, the first American woman in space. She attends high school in Greenbelt, Maryland near NASA's Goddard Space Flight Center and is active in STEM (science, technology, engineering and math) programs. Ride, Lillian said, was an inspiration not just because she was a pioneering astronaut, but also because she did so much to encourage STEM for students. Other members of Gunn's group carried puppets of famed astronomer Carl Sagan, astrophysicist Neil deGrasse Tyson and NASA mathematician Katherine Johnson. Earlier in the week, Tyson released a video to support science. Keeping jobs in the United States is a big issue for the Trump administration, and mechanical engineer Adam Yeager of Lancaster, Pennsylvania wanted to remind President Trump that NASA's rockets are truly made in America. Yeager, 32, penned one sign showing a Saturn V moon rocket labeled as "Made in America" on one side. A Miss Frizzle 2020 candidate sign covered the other side (Frizzle is the teacher from the animated science television show "The Magic School Bus.") A second sign read: "Funding Science Is Patriotic." Yeager made the signs for himself and childhood friend Brad Ochock, an ecologist based in Houston (it was Ochock who carred the "Made in America" sign). Despite living in different states, the two men reconnected in Washington D.C. for the March for Science. "We really wanted to show up and give our support" for science, Ochock said. Yeager said he wanted his signs to remind people that the United States has achieved mighty scientific feats when the government funded big engineering projects.